When a hedgehog senses danger, or is uncertain about something in its environment, its first line of defense is to ball up. The orbicularis muscle, which runs around the edge of its body, makes this classic hedgehog trait possible. To ball up, a hedgehog tightens this muscle, which acts like a drawstring. This enables the hedgehog to hide its head, belly, feet, and legs in a prickly coat of erect spines. A balled-up hedgehog may also snuffle, huffle, snort, or pop to seem scarier and more menacing to potential dangers. An obese hedgehog may not be able to roll into a tight ball. This is a sure sign that the hedgehog needs a change in its diet, supervised by your veterinarian. Sick, injured, cold, or lethargic hedgies may not be able to uncurl, or they may not be able to ball up. These hedgehogs need immediate veterinary attention. Hedgehogs will also ball themselves up when they are falling to cushion the impact. This tuck-and-roll technique is similar to that of paratroopers, and it gives hedgies a sense of fearlessness when falling. Even though the quills act as natural shock absorbers, a hedgehog can still be injured in a fall as the quills can actually puncture inward. It is always better to prevent falling, even if your hedgehog does not seem to mind it. Hedgehogs are defending themselves as best as they can when they ball up, but this does not protect them from human cruelty. 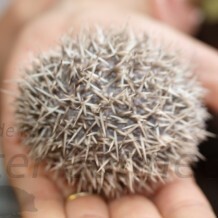 Some hedgehog owners may think that their hedgehog “likes to be rolled” while it is in a ball. Hedgehog experts disagree with this practice. Again, when a hedgehog balls up, it is trying to protect itself. Please be sensitive to your hedgehog and try to make it more comfortable, rather than perpetuating its feelings of insecurity.